The second season of developer Telltale's Game of the Year was like running into an old friend that just got back from being overseas, and now they have grown into something much wiser. This time around you take the role of Clementine, the young girl who learned to turn fear into strength throughout the first Walking Dead title. In the first game, you played the part of her role model, as the father figure that needed to teach her to survive no matter what happened. Once playing season two of The Walking Dead, you find yourself in the shoes of your creation. You find yourself remembering the lessons that you learned from Lee, the lessons you learned from yourself. Alert: From here on out there will be The Walking Dead season one spoilers. If you haven't played that yet you shouldn't be reading this anyway. Seriously, go play it. Even though you are able to load in your save from your playthrough of the first game, it doesn't seem to have a whole lot of effect on the second title. There were a few moments that I could tell were affected, one of the most prominent being that some of my responses differed due to the fact that I had chosen to shoot Lee at the end of the first game. This may be partially due to the fact that season two takes place mostly two years after the first season. Even though you now play as a very different character, the feel of the game is the same. Even though the theme of The Walking Dead universe is survival, the theme that is inherently needed to make the story so compelling is growth. This is where Telltale shines. "The feel of the game is the same. Even though the theme of The Walking Dead universe is survival, the theme that is inherently needed to make the story so compelling is growth. This is where Telltale shines." Season two brings in an entirely new set of characters that Clementine has to deal with. Though the overarching plot of the new season seems to be pretty vague as of right now, All That Remains makes up for it with some very powerful character development. The characters that Clementine runs into are rich with drama, and each have very different outlooks on the apocalypse that they have been thrown into. With these powerful characters and scenes, season two has been able to highlight the same intensities that were created throughout the first season, at times even taking it to the next level. Telltale was able to keep me sitting at the edge of my seat with every gory detail. The queasy and faint of heart beware: You're in for a pretty wild ride. Though there were a few awkward moments where the slightly weak animations seem to fall short, the compelling music and amazing art keep you from becoming distracted from the narrative, which is the entire focus of the series to begin with. Most importantly, the decisions that are required of you are just as amazing and impactful as they were in the first game, and even sometimes seemed more fun. Sure, there are still the incredibly hard choices, like save person one or person two, or which side you should take in an argument, but the dialogue decisions seemed to be even better than from the last title. 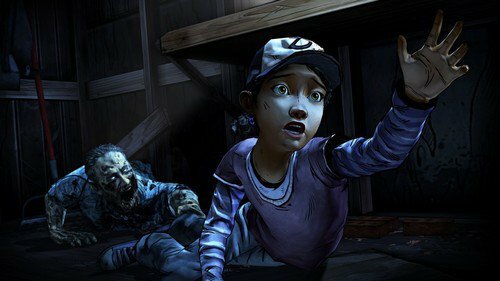 This may have been because you are now Clementine instead of Lee, but some of the things that you can say were sarcastic and witty far beyond what you expected from this little girl's mouth. As much as we saw Clementine grow within the entire first season, it seems that in ways she grew even more just within this premiere episode. Clementine deals with having lost everything and has to become a mature woman quickly. This is achieved in a better way than I ever expected, and Telltale once again has kept me literally crying for more.